Walkers for handicap people, also known as mobility walkers, roller walkers, rollators or just plain “walkers,” are devices that help the handicapped or disabled people retain their mobility. Often used by the elderly, walkers allow users to lean their weight onto the device’s handle, making it easier to move even if muscles are weak. These disabled mobility equipment can also be used as a seat or a travel companion to help carry the groceries. Unlike canes, handicap walkers have four widely-spaced legs. This wide spacing gives them far better stability than even four-legged canes. 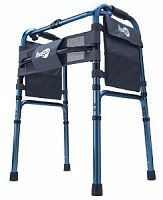 The senior walkers are usually made of hollow aluminum tubing, which gives them a light weight, yet allows them to have enough strength to hold up someone who leans on them. For someone with limited mobility and needs little assistance, these lift handicap walkers are the most affordable and efficient handicapped equipment. For someone who wants more assistance, there are rolling senior walkers that have wheels and brake controls for going down hills. Despite seemingly light weight, sometimes it is impossible for a user of a lift handicap walker to raise it with each step. For these people who have trouble with lift walkers, there are walkers with wheels, also known as push handicap walkers. Wheeled models can have wheels on just the front two legs or on all four. The senior two-wheeled walkers need to be tilted upward for each step, but can offer stable support when the back two legs are put on the ground so they will not roll away. Rollator transport walkers with four wheels don’t need to be lifted at all; however one must be a bit more careful when leaning on them. These four wheel handicap walkers often come with shopping baskets bolted between their legs making them ideal for grocery shopping or other times when the user needs to carry or delivery items. The push handicap walkers are best used for carpeted areas because they can reduce the chances of getting caught in the carpet fiber. Lift handicap walkers might snag easier and cause injury. 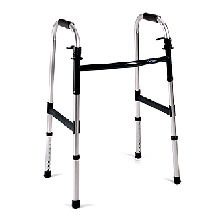 Narrow Folding Walkers – If you are looking for affordable narrow walkers that fit through doorways and walkways very easily, consider this less than 20 inches wide walker. It is foldable and lightweight. It is also small enough where it can easily turn tight corners while still having a frame that supports 300lbs. If you need more weight support, consider bariatric walkers. Some handicap walkers are equipped with padded seats. These seats are perfect for long lines in hospitals, insurance and medical offices. Standing in line puts more stress on the knees and feet because all the bodyweight is positioned directly on top of them. Checking out in supermarket and shopping malls will be much easier when you have a seat to wait out the other customers. You can also have the option of having a basket on the medical walker to carry your groceries and personal belongings. Narrow Handicap Walkers With Seats – This walker is narrower than most standard walkers and comes with an optional rubber seat pad. It is also foldable for storage. Using a handicap walker can greatly improve the quality of life of someone who would otherwise be unable to walk or be at a high risk of falling. Instead of having to either stay home or wait for someone to assist, walker users can go out when they feel the urge. This allows users to maintain their mobility and independence. Another advantage of handicap walkers is their price compared to handicapped scooters and mobility wheelchairs. The price of handicap walkers ranges from as low as about $50 to as much as $200 for heavy-duty bariatric walkers. Insurance should cover the cost if the walker has been prescribed by a doctor. People who have a lot of trouble, walking or carrying heavy grocery shopping items, should definitely consider the use of a medical walker. The improvement in mobility, independence, and walking safety is well worth the use of these devices. 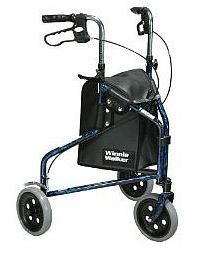 Here are some of the recommended walkers for seniors. Each one has their own benefits and should be purchased depending on the user’s needs. Red Handicap Walker with Seat – The walker comes with a seat and basket and is perfect for long lines or waiting for the bus when there are no benches around. This is one of the best walkers with seats. Three Wheel Walker – A three wheeled walker is usually smaller and can fit in areas of the car or home better than 4 wheeled walkers after it is folded up. In addition, the smaller size means the handicap walker will weight less. Prices are similar to the 4 wheeled versions. However, these three wheeled roller walkers are less stable than the 4 wheels. There is a slight tendency to tilt to one side if pressure is being applied. If size is your concern, then this piece of mobility equipment will fit that bill. Simple Transport Walker With Wheels – This is a folding walker with two large wheels in the front for maximum stability on grass surfaces. It can also be a portable handicap walker and folded up easily with a two button release. Supports 250lbs. It is highly recommended by many users. Narrow Folding Walkers – Click to see the description of this product. 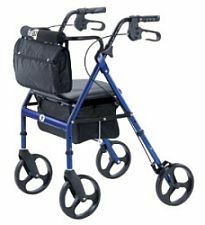 Blue Handicap Rollator Walker – This is also a push walker that has big wheels, good for outside use. Comes with a grocery basket for grocery shopping. 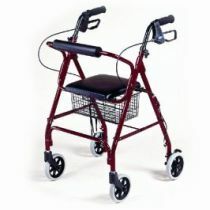 Lift Handicap Walkers – This is a aluminum senior walker that requires the user to lift rather than push. It is the cheapest and most simple of the handicap walkers. For short distances, it does the job, supporting up to 300lbs. 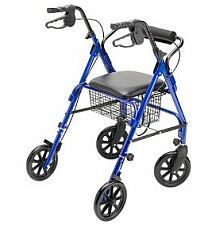 The best thing about this medical walker is the ability to install walker accessories like adding 5 inch wheels or a shopping basket for groceries. The wheels can turn the lift handicap walker into a push handicap walker. A great accessory that others have found very useful are clip on handicap walker lights. They are great for walking in dim-lighted halls. Portable Rolling Walkers – Has all the walker accessories one would typically require such as a seat and backrest and big wheels to handle most surfaces and give extra stability.